This wonderful rare honey comes from Romania and is considered by some to be the best in the world. 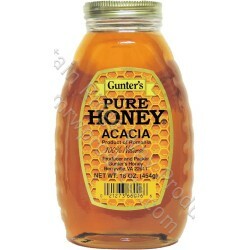 Light in color and very floral on the nose, Acacia honey has a floral taste with a hint of vanilla in the after taste. One of the best honey's for cooking and deserts as well as for drinks. It mixes extremely well even with cold food or drinks. It does not overwhelm the flavor of foods. High in fructose and low in sucrose, with a Glycemic index around 32.